This Sunday is Holocaust Memorial Day, and later in the evening I have been invited to Holocaust Memorial Day commemorations in the Mansion House, Dublin. 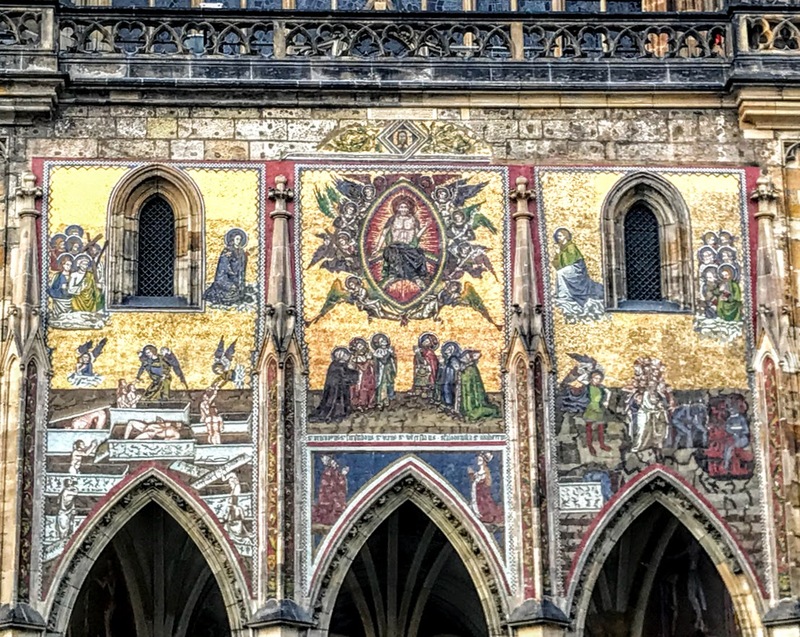 Over the past few days, even while I was in Prague, I have been putting the finishing touches to my sermon for tomorrow, drawing on the Gospel reading (Luke 4: 14-21 [22-30]), which tells of the story of Jesus reading from the scrolls in the synagogue in Nazareth and being rejected. The longer version of this Gospel reading, which may not be heard in many churches tomorrow, tells how many of the people who hear Jesus teaching that Saturday morning rejected his teaching and plotted to murder him. It is a response that has been used and misused by many antisemitic writers to justify their views, claiming that because these people plotted to kill Jesus, Jews had rejected Christ. It is a misappropriation of the Gospel message that typifies the vile antisemitism found in the writings of Martin Luther and that later allowed some so-called German Christians to justify their support for the Nazis. During the past week in Prague I visited six synagogues in Prague – the Old-New Synagogue, which is one of the oldest surviving synagogues in Europe; the high Synagogue; the Spanish Synagogue; the Pinkas Synagogue; the Maisel Synagogue; the Klausen Synagogue – as well as the Old Jewish Cemetery and the former Ceremonial Hall. 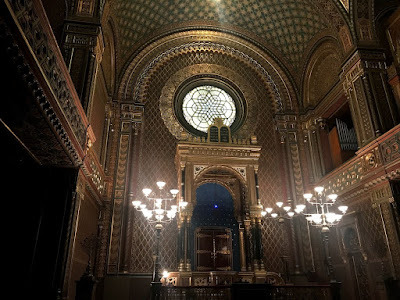 Later, I returned to the Spanish Synagogue on Thursday evening for a concert by the Czech Collegium and the celebrated sopranist Michaela Srumova. The Czech Collegium is made up of leading players from the Prague FOK Symphony Orchestra. It has been in existence 1997, and as an ensemble devotes itself mainly to chamber music. Appropriately, the concert programme in the Spanish Synagogue included music from Fiddler on the Roof and Leonard Cohen’s Hallelujah, and Mendelssohn’s Oratorio Elijah-Hore, Israel. Prague was once one of the most tolerant cities in Europe. The Emperor Joseph II abolished all legalised discrimination against Jews in Prague at the end of the 18th century. Special clothing was no longer required, access to higher education and the professions was provided, Jews were no longer confined to the ghetto, and the Jewish community in Prague prospered. But all that came to a sudden end when Nazi Germany invaded what we now call the Czech Republic in 1939. The majority of Jews in the Czech lands were deported in mass numbers to places such Terizin, and then sent on to death camps such as Auschwitz. Almost 80,000 Jews from the Czech lands were murdered in the Holocaust. By 1945, only 14,000 Jews remained alive in the Czech lands. 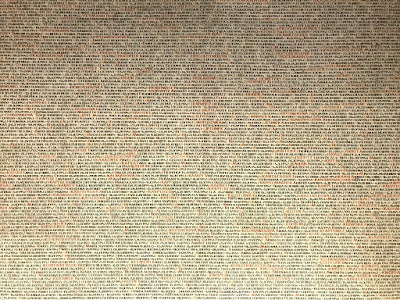 In the Pinkas Synagogue in the centre of the Old Jewish Town of Prague, the walls are covered with the names of 77,727 people. 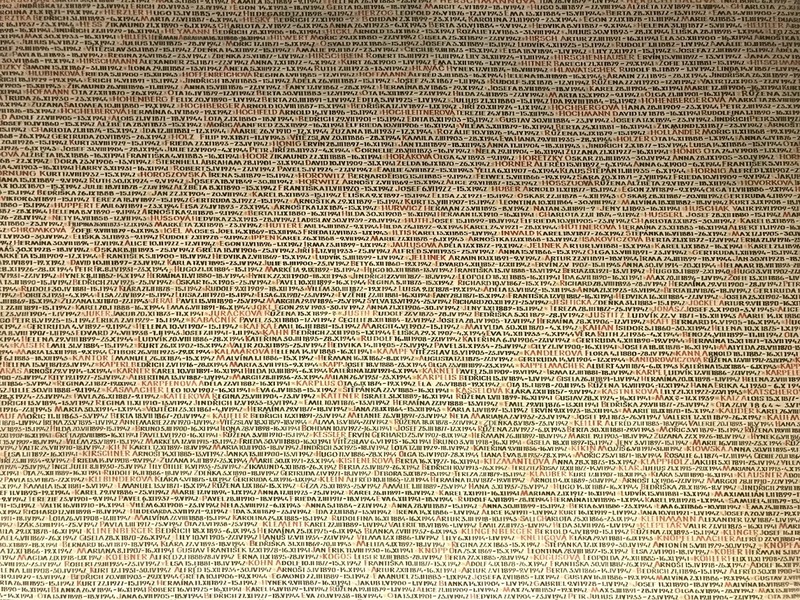 So many are the names that they are painted in tiny figures so all can be squeezed into the lettering that covers these walls. So many small letters to tell of the enormity that is the Holocaust. It is overwhelming, over-powering, to look at these names. 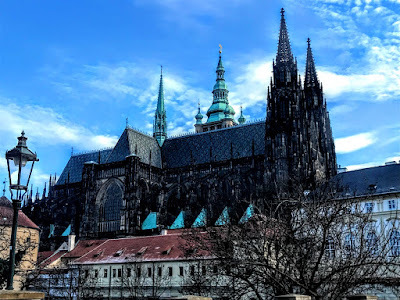 I spent an afternoon this week exploring Prague Castle and visiting Saint Vitus’s Cathedral, a key architectural building that has influenced Gothic architecture throughout Europe. This spectacular cathedral in the grounds of Prague Castle stands in a dominant position at the top of Hradcany Hill. 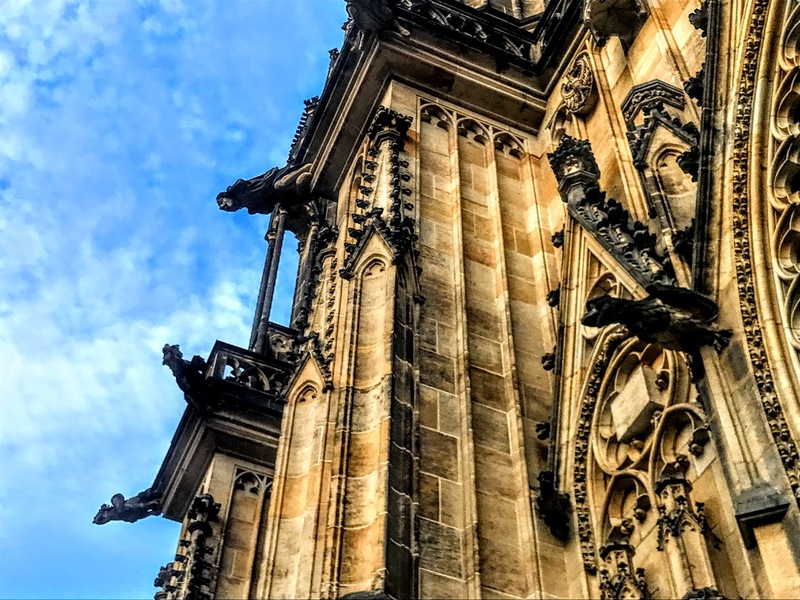 It is the Czech capital’s most prominent landmark and its spires can be seen from every vantage point throughout the city. 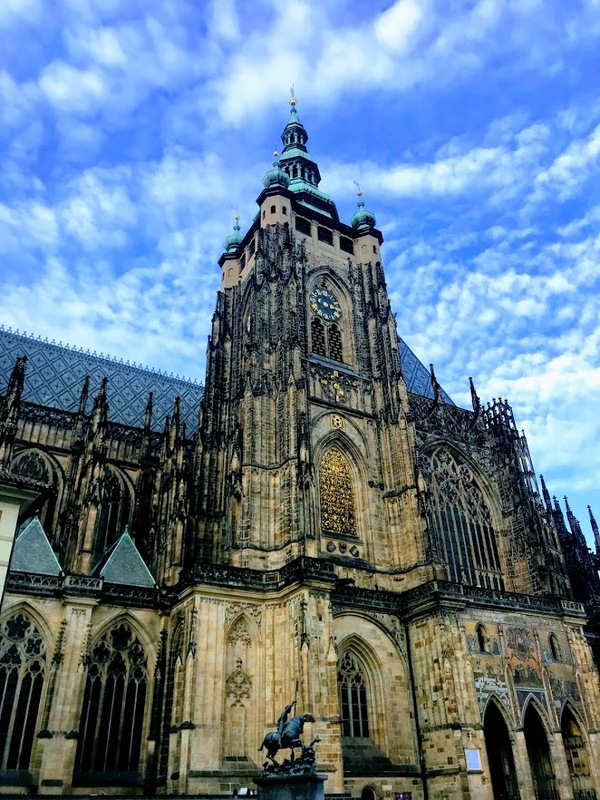 The cathedral is the seat of the Archbishop of Prague but is owned by the Czech government as part of the Prague Castle complex. It is the largest and most important church in the Czech Republic and here too are the tombs of King Wenceslas and many Bohemian kings and Holy Roman Emperors, as well as the Bohemian crown jewels. The dimensions of the cathedral are 124 by 60 metres, the main tower is 102.8 metres high, the front towers 82 metres, and the arch height is 33.2 metres. The current cathedral took almost 600 years to build, and this is the third of a series of religious buildings on this site, all dedicated to Saint Vitus. Saint Vitus, a Roman martyr was chosen as the patron when Wenceslas acquired the arm of the saint as a relic from Emperor Henry I. When the Bishopric of Prague was founded in 1060, Prince Spytihněv II began building a larger Romanesque basilica on the site. This was a triple-aisled basilica with two choirs and a pair of towers connected to the western transept. The design was inspired by Romanesque architecture in the Holy Roman Empire, including the abbey church in Hildesheim and Speyer Cathedral. 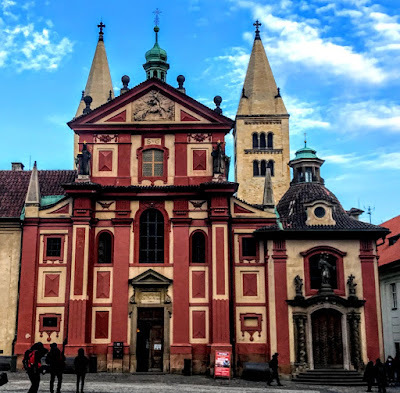 The south apse of the older church was incorporated into the eastern transept because it included the tomb of Saint Wenceslaus, who had become the patron of the Czech princes. Work on building the present Gothic cathedral began on 21 November 1344, when the Bishops of Prague were raised to the rank of archbishops. King John of Bohemia laid the foundation stone for the new building. 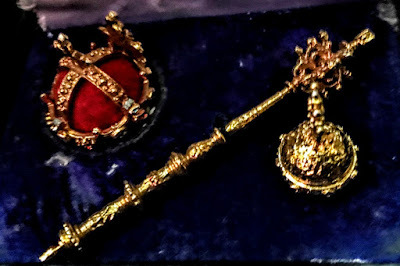 The patrons were the dean and chapter of cathedral, Archbishop Arnost of Pardubice and King Charles IV of Bohemia, soon to become the Holy Roman Emperor. 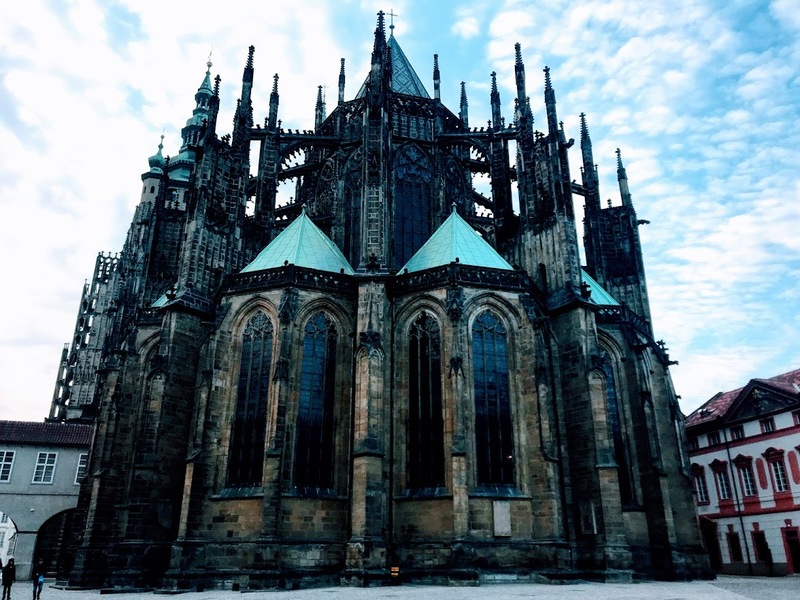 Charles IV envisioned the new cathedral as a coronation church, family crypt, treasury and the tomb of Saint Wenceslas. The first master builder was Matthias of Arras, who was brought from the Papal Palace in Avignon. Matthias designed the overall layout of the building in the style of a French Gothic cathedral. This included a triple-nave basilica with flying buttresses, a short transept, a five-bayed choir and a five-sided apse with an ambulatory and radiating chapels. However, Matthias lived only long enough to build the most easterly parts of the choir: the arcades and the ambulatory. The slender vertical lines of late French Gothic style and clear proportions indicate his work. After Matthias died in 1352, 23-year-old Peter Parler assumed control of the cathedral workshop as master builder. At first, Parler only worked on plans left by Matthias, building the sacristy on the north side of the choir and the chapel on the south. 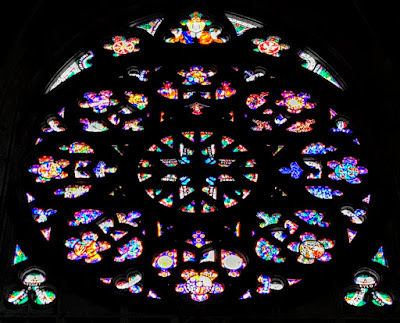 But once he had finished all that Matthias left unfinished, Parler continued with his own innovative ideas, with a unique new synthesis of Gothic elements seen in the vaults he designed for the choir. Parler trained as a sculptor and woodcarver, and he approached architecture as a sculpture. His vaults have double diagonal ribs that span the width of the choir-bay. The crossing pairs of ribs create a net-like construction that considerably strengthens the vault. They also give a lively ornamentation to the ceiling, as the interlocking vaulted bays create a dynamic zig-zag pattern the length of the cathedral. His pillars have classic, bell-shaped columns, and he designed the dome vault of the new Saint Wenceslaus chapel, the clerestory walls, the original window tracery and the blind tracery panels of the buttresses. 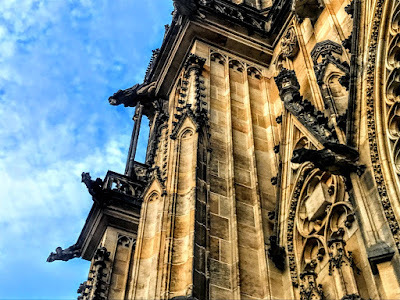 His influence is also seen in the corbels, the passageway lintels, and the busts on the triforium, depicting faces of the royal family, saints, Bishops of Prague, and the two master builders, Matthias and Parler. 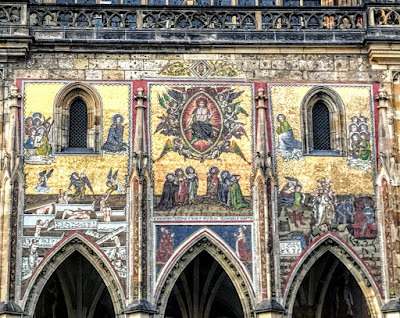 However, work on the cathedral proceeded slowly because the Emperor wanted Parler to work on other projects, including the new Charles Bridge in Prague and many churches. When Peter Parler died in 1399, only the choir and parts of the transept were finished. Parler’s sons, Wenzel and Johannes Parler, continued his work, and they in turn were succeeded by a Master Petrilk. Under these three masters, the transept and the great tower on its south side were finished, as well as the gable that connects the tower with the south transept. 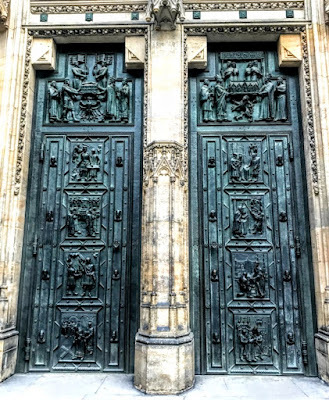 Known as the ‘Golden Gate’ because of its golden mosaic of the Last Judgment depicted on it, the kings entered the cathedral through this door for their coronations. The Hussite Wars put a stop to building work in the first half of 15th century. The workshops closed, and the cathedral furnishings, pictures and sculptures were damaged. A century later, a great fire heavily damaged the cathedral in 1541. Several attempts to resume work on the cathedral were unsuccessful. Later attempts only brought some Renaissance and Baroque elements into the Gothic building, including the baroque spire of the south tower and the great organ in the north wing of the transept. 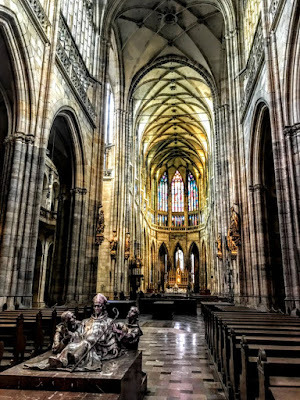 At a conference of German architects in Prague in 1844, Václav Pešina, a canon of the cathedral, and the architect Josef Kranner presented a programme to renovate and complete the cathedral, and a society was formed to promote the completion of the cathedral. Josef Kranner headed the restoration work in 1861-1866 which consisted mostly of repairs, removing many baroque decorations and restoring the interior. The foundations of the new nave were laid in 1870, and in 1873, after Kramer’s death, the work passed to the architect Josef Mocker, who designed the west façade in a classic Gothic manner with two towers. After Mocker’s death, Kamil Hilbert became the third and final architect of the cathedral restoration. 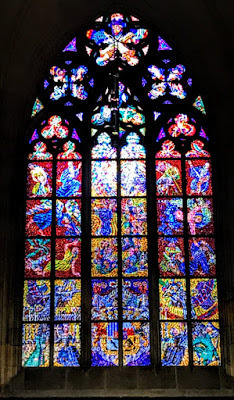 The sculptor Vojtěch Sucharda worked on the façade in the 1920s, and the Czech Art Nouveau painter Alfons Mucha decorated the new windows in the north nave. Frantisek Kysela designed the Rose Window (1925-1927) that depicts scenes in the creation story. Saint Vitus Cathedral was finally finished in 1929, in time for the Saint Wenceslas celebrations and almost six centuries – 585 years – after it began. Although the entire west half of cathedral is a neo-Gothic addition, much of the design and elements developed by Peter Parler were used in the restoration, giving the cathedral a harmonious, unified appearance as a whole. The cathedral has influenced the development of Late Gothic architecture throughout Central Europe, including the Stephansdom cathedral in Vienna, Strasbourg Cathedral, Saint Marko’s Church in Zagreb and Saint Barbara’s Church in Kutna Hora. Regional Gothic styles in Slovenia, northern Croatia, Austria, the Czech Republic and southern Germany were all heavily influenced by Parler’s design, especially his net vaults. Did Parler’s work on Saint Vitus Cathedral, with the ingenuity and ornamentation in his design of the vaults, influence the Perpendicular Style of English Gothic at the end of 14th century, or was it the other way around? Saint Wenceslas Chapel is not open to the public but can be viewed from the doorways. A small door with seven locks leads from a corner of the chapel to the Crown Chamber containing the Czech Crown Jewels, displayed to the public only once every eight years or so. Visitors also have their attention drawn to the spires, the gargoyles, the stained-glass windows. But close by are many other church buildings, including the Archbishop’s Palace, the Church of the Holy Spirit and the Basilica of Saint George, the best-preserved Romanesque church in Prague. It dates from 973, and the rust red façade is a 17th century baroque addition. A government decree in 1954 entrusted Prague Castle to ‘all Czechoslovak people’ and to the administration of the President’s Office. 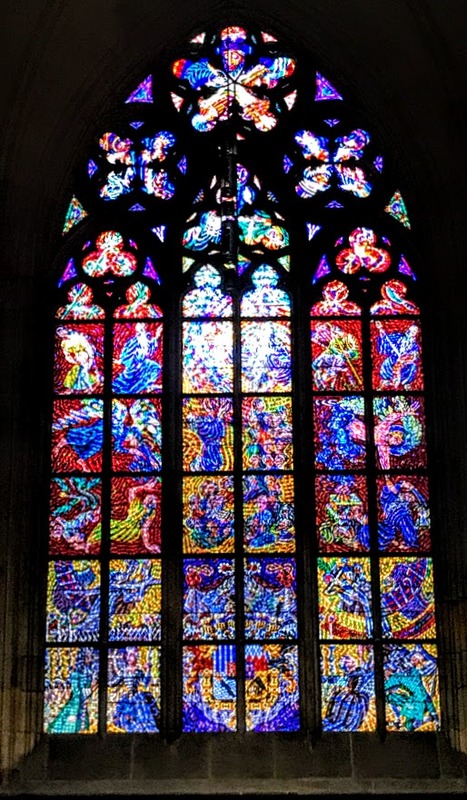 Today, the Metropolitan Cathedral of Saint Vitus, Saint Wenceslaus and Saint Adalbert is the Roman Catholic cathedral of Prague and the seat of the Archbishop of Prague. Until 1997, the cathedral was dedicated only to Saint Vitus, and it is still known popularly only as Saint Vitus Cathedral. In 1997, on 1000th anniversary of the death of Saint Voitechus, the church was re-dedicated to Saint Wenceslas and Saint Adalbert. The Roman Catholic Church has filed several petitions on the ownership of the cathedral. In 2006, the President’s Office ceded the administration of the cathedral to the Metropolitan Chapter. But the courts have ruled that the cathedral is owned by the Czech Republic, although the chapter owns the interior furnishings.